The draft resolution approved in the Third Committee of the General Assembly mentions gender identity as a characteristic warranting protection from unlawful executions for the first time. A United Nations committee overseeing human rights issues approved a draft resolution Tuesday that for the first time acknowledges the need to protect individuals from extrajudicial executions on the basis of their gender identity. The Third Committee of the General Assembly passed the resolution by a vote of 108 to 1, with 65 abstentions and 18 absences. Iran was the only country to oppose the resolution, which was approved after “rigorous debate” over the language, according to a United Nations news release. Sweden introduced the resolution co-sponsored by 34 states. The text reiterates states’ obligation to conduct prompt, comprehensive, and fair investigations into all suspected extrajudicial, arbitrary and summary executions, and urges states to investigate all killings, including those of people targeted for their sexual orientation, gender identity and other reasons. Two years ago, the reference to “sexual orientation” was removed from the draft resolution following an effort led by a group of African states. The language was later restored in a vote in the General Assembly after a last-minute push coordinated by the United States. Blocks of countries challenged the concept of rights based on sexual orientation and gender identity again this year. 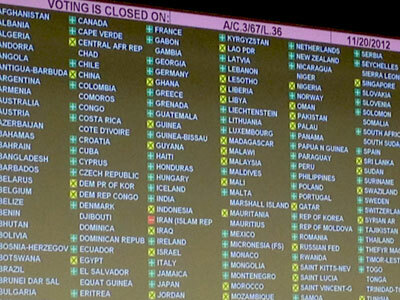 The United Arab Emirates sponsored an amendment on behalf of the Organization of the Islamic Cooperation that would have removed the language about sexual orientation and gender identity, but it was defeated by a vote of 86 to 44, with 31 abstentions and 32 absences. In a separate track, the Holy See led an effort that would have stripped references to all vulnerable groups, but the proposal was never formally introduced. The passage of the draft resolution mentioning gender identity caps two years of historic developments for LGBT human rights advocates at the United Nations. Last year, the UN Human Rights Council passed the first resolution endorsing the rights of LGBT people, inclusive of sexual orientation and gender identity. Susan Rice, the U.S. ambassador to the United Nations, said the vote on the draft resolution on extrajudicial killings aligned with her country's efforts to ensure that "human rights protections continue to be extended to all, regardless of who they are or whom they love." Rice, a top candidate to succeed Hillary Clinton as Secretary of State, led the effort to reinsert the language on sexual orientation into the resolution in 2010. “It is fitting, on National Transgender Day of Remembrance, that the Third Committee agreed to acknowledge protections from extrajudicial, summary, or arbitrary executions on the basis of gender identity for the very first time,” she said in a statement.